Brilliant, Ready-to-Use Colors. 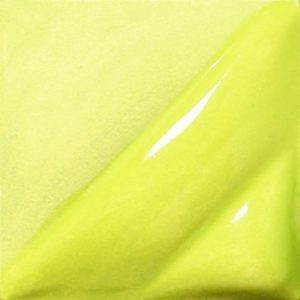 The concentrated, opaque colors are recommended for covering large areas quickly, easily and smoothly. Results are equally effective when the colors are used for detailed painting, sgraffito decoration, water color effects, free brush painting, wax resists and mishima decoration. AMACO LUG’s may be brushed on greenware which is to be bisque fired before applying a covering glaze, or on mature Cone 04 bisque, then a covering glaze applied. White slip may be tinted by adding small amounts of most LUG colors to produce colored slip. Intensity depends on quantity used. To color moist clay, cut clay in very thin slices, pour LUG color between slices and wedge until uniform color is achieved. Since the colors are approximately the same tone before and after firing, the effectiveness of color combinations and blending is observed as the glazing progresses. Transparent covering glazes are applied on decorated bisque shapes, then fired to the maturing temperature of the glaze. 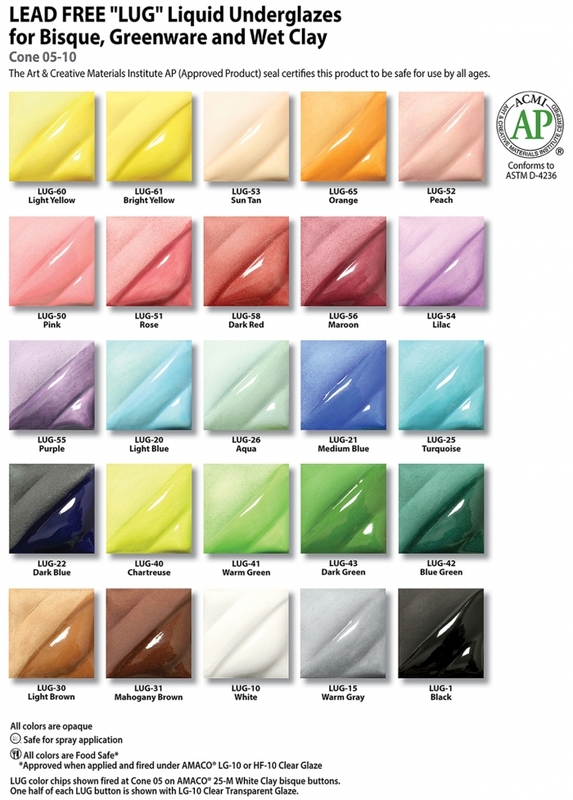 AMACO glazes LG-10, F-10, DC-10, and HF-9 are recommended as clear glaze. LUG-25 will appear Blue Turquoise under LG-10. Transparent colored glazes in the LG, F, and HF series may be used for unusual effects. For best results with LUG-51, LUG-52, LUG-54, LUG-55, and LUG-56, apply only two coats of LG-10 Clear Glaze. If left unglazed, AMACO LUGs should not be used on surfaces which come in contact with food or drink. LUGs are dinnerware safe when covered by AMACO clear glazes LG-10, F-10, and HF-9 or any other dinnerware safe glaze. AMACO LUGs have only been tested and approved as dinnerware safe when applied and fired under AMACO LG-10 Clear Glaze. Set 712: One 2 oz. 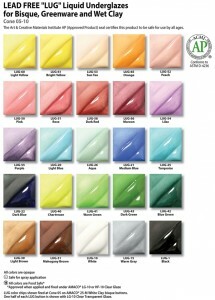 jar each of: Black, White, Light Blue, Dark Blue, Aqua, Light Brown, Blue Green, Dark Green, Rose, Peach, Dark Red, Light Yellow. Set 812: One 2 oz. jar each of: Warm Gray, Medium Blue, Turquoise, Mahogany Brown, Chartreuse, Warm Green, Pink, Sun Tan, Lilac, Purple, Bright Yellow, Orange.